The Euro closed little changed for a second consecutive day at around 1.1330/40, as traders can't make up their minds on whether to make a decision based on either the latest FOMC decision or on the threat of a slowing economy in the EU. The common currency fell with the release of February’s Markit PMI, which showed that the manufacturing sector contracted, both in Germany and the EU. The EU Manufacturing PMI printed 49.2, its lowest since June 2013, and the German index printed 47.6 missing the 50 expectation. The US Dollar was unable to hold on to gains, after the release of December Durable Goods Orders, as the core capital goods orders unexpectedly fell by 0.7%, and the November figure was revised to -1.0%. Moreover, Existing Home Sales decreased by 1.2% in January vs. an expected 0.8% advance. Today, we have EU’s inflation data, the German IFO survey for February and a Draghi speech later in the day. Meanwhile in the US, multiple Fed's officials are scheduled to speak related to the monetary policy. The Euro, for the second consecutive day, attempted to break above 1.1350 after being rejected yet again. 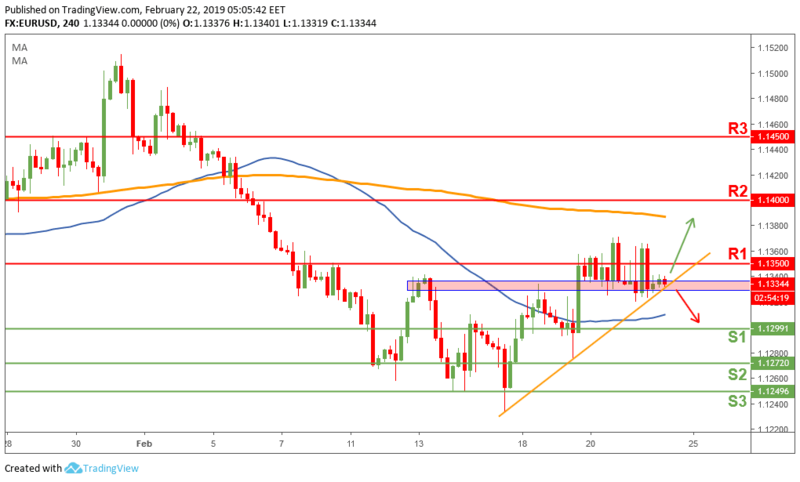 However, price remains bullish as it is still trading above the 1.1325 minor support and the short-term uptrend (orange trend line). Only a break below those levels will open a door for more weakness on this pair. The market needs a break to either side to confirm the next trajectory.